Matt’s in the driving seat as he goes for gold with new sporting challenge | News by Wales Express News, People Before Profit! 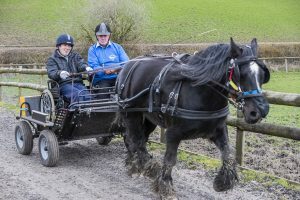 An all-action admin assistant who has cerebral palsy is aiming to strike gold after taking up the Duke of Edinbugh’s favourite sport – carriage driving. Matt Palamarczuk, 33, is already a qualified Paralympic coach in the sport of boccia which he has championed at the Pendine Park care organisation where he works. Now Matt, a permanent wheelchair user, has next year’s Riding for the Disabled national carriage driving championships in his sights. He’s been attending the Clwyd Special Riding Centre in Llanfynydd, in Flintshire, since he was in primary school and took up carriage driving after the horse he used to ride retired. In addition he goes on annual skiing holidays the French Alps and has a Duke of Edinburgh Bronze Award. He became a boccia fan after watching it at the 2012 London Paralympic Games during which he was proud to see that Team GB lifted a silver and a bronze medal. Matt started playing boccia himself, travelling with friends to play at Stockport. He enjoyed it so much that he decided to train for his Boccia Leaders Award, gaining his coaching certificate after an assessment in Mansfield, and now runs regular boccia sessions for residents at Pendine Park. But the love of horses has never waned. Matt said: “I did ride various horses over the years but Charlie was a real favourite, a true gentle giant, although he could be a bit feisty on occasions. “After Charlie retired there wasn’t really a horse suitable for me so I decided to give carriage driving a go. “I love going to the Clwyd Special Riding Centre as you are given real personal attention and they are really safety conscious and yet it’s really good fun. It’s a social and physical outlet which I really enjoy. 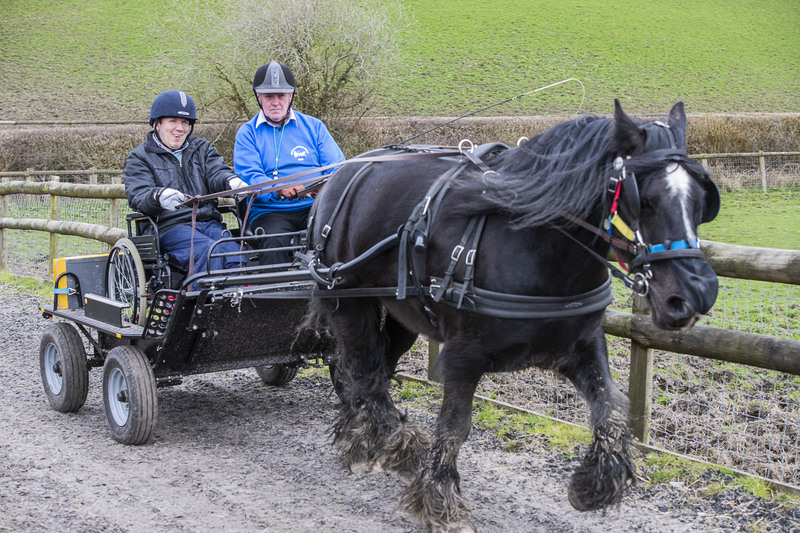 “I’m enjoying carriage driving as I enjoy controlling the horse but it is quite difficult with my disability. I have to control the horse and be aware of the carriage at the same time. My instructor, John, really encourages me. Matt lives with his parents and has two sisters, Nicky who lives in London and Julia who lives in Kettering and he says he enjoys being an uncle to their children, Evie and Luka who are both nearly two. He said: “I have always refused to allow my disability to stop me doing what I can in life. I really enjoy working as an admin assistant with the Business Operations team at Pendine Park. “I work with a great team and I really enjoy my job. It’s fantastic that I’m allowed to attend Clwyd Special Riding Centre each Monday. “My line managers have always accommodated me by allowing me time out to go riding or carriage driving. I take time off on a Monday and make it up on the Tuesday. I appreciate their flexibility. And Matt, who attended Roftt CP school in Marford, Darland High School in Rossett and Yale College, now Coleg Cambria, says he has just returned from Belgium where he had an appointment with a Russian mathematician and biomechanicus who has developed an innovative therapy that helps cerebral palsy sufferers. He said: “I go to see Leonid Blyum a couple of times a year. He has developed the ABR therapy which helps rebuild the strength, structure and function of the body. “He gives mum exercises to do with me, I think of it as being like a footballer having to do certain training. Mum does the exercises with me three or four times a week. Diane Porter, from the Clwyd Special Riding Centre, says Matt is very popular with both staff and other users of the centre. She said: “He has a wonderful sense of humour and has been coming here for many years.